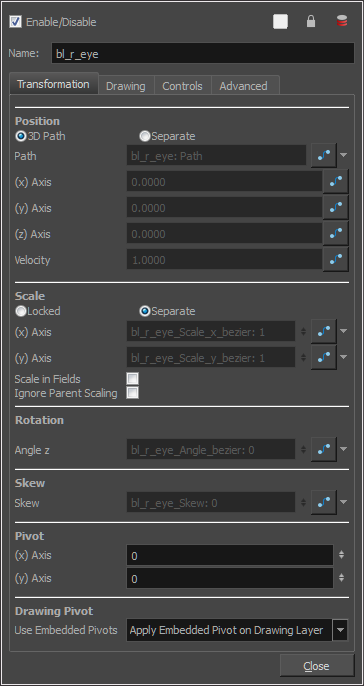 Scale in Fields: Instead of using the standard scaling units, when this option is enabled, images are scaled using field units, based on the traditional animation field chart. Ignore Parent Scaling: When this option is enabled, any scaling value applied to a parent layer is ignored in the current layer. This can be handy in cut-out rigs when you need to scale an arm without affecting the forearm. This is a permanent pivot, sometime referred to as peg pivot, that is applied to the entire drawing or peg layer. If you modify its position, it will be changed for the entire layer, modifying the animation, scale and rotation interpolation. The permanent pivot is set using the Rotate, Translate or Scale tool. The Transform tool will only move that pivot temporarily for positioning purposes, but the animation interpolation will be done from the original permanent pivot's position. The Transform tool is designed to move the pivot temporarily during the animation process. It also permits you to select multiple pegs and apply a common temporary pivot. To permanently move a peg pivot, use the Rotate or Scale tool. You can also directly type the values in the Layer Properties window in the Pivot section's (x) Axis and (y) Axis fields. In the Layer Properties window, in the Drawing Pivot section, select the Don't Use Embedded Pivot option to use the permanent pivot. The Drawing pivot is contained within each drawing. In one layer, each drawing can have its own pivot. If you have many different views of a character within one layer, the pivot can be different and the animation will adjust to the pivot. The Drawing pivot can also be referred to as embedded pivot. If you are not mixing different views within the same layers or are using pegs to animate your layers, it is recommended to use the permanent pivot. You can set a different pivot for each one of your drawings. For example, if you have a series of drawings from different views, they are not likely to rotate from the same location. In that case, you can set a different pivot for these drawings by using the Drawing Pivot tool—see Drawing Pivot Tool. In the Layer Properties window, in the Drawing Pivot section, select the Apply Embedded Pivot on Drawing Layer option to use the drawing pivot directly on the drawing layer. If you want to apply the drawing pivot to a parent peg to force the peg to follow the drawing pivot variations, enable the Apply Embedded Pivot on Parent Peg option. The Symbol pivot is similar to the Drawing pivot. Each symbol cell can have its own pivot and act the same as the Drawing pivot. The Symbol pivot can also be referred to as embedded pivot. Inside a symbol, each drawing can have its own pivot. If you are not mixing different views within the same layers or are using pegs to animate your layers, it is recommended to use the Peg pivot—see Setting Different Pivots for a Puppet Using Symbols. 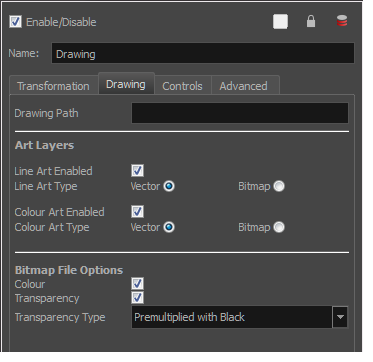 The Drawing tab contains parameters for the element columns, designating art layers, and setting bitmap options. Overlay Art Enabled: Enables the Overlay Art display. Line Art Enabled: Enables the Line Art display. Colour Art Enabled: Enables the Colour Art display. Underlay Art Enabled: Enables the Underlay Art display. Overlay Art Type: Allows you to set the Overlay Art as Vector or Bitmap type. Line Art Type: Allows you to set the Line Art as Vector or Bitmap type. Colour Art Type: Allows you to set the Colour Art as Vector or Bitmap type. Underlay Art Type: Allows you to set the Underlay Art as Vector or Bitmap type. When an image is created with an external software and that image has some transparency, there are several formats the software can use when writing the RBG channels. The purpose of the four import options for the transparency is for the user to tell Harmony how to interpret the RGB channels of the imported image. The correct option has to match the ouput format of the software that was used to create the image in the first place. For instance, if the you used Adobe Photoshop and exported an image as Straight, then it should be imported in Harmony as Straight in order to get the correct result. Note that if the image has no alpha channel or if it does have an alpha channel and all the pixels are 100% opaque, it does not make any difference which option is selected. Colour: Controls the production of colour information from bitmap images. If this module reads 3 or 4-channel bitmaps, this selection determines whether the colour should be read or ignored. If this module reads 1-channel bitmaps, this selection determines whether the channel should be read as colour. When this option is selected with 1-channel images, the resulting image will be a greyscale image. Transparency: Controls the production of alpha information from bitmap images. If this module reads a 1 or 3-channel image, this option will create a matte from the colour values in the image. If the module reads a 4-channel image and this option is not selected, the alpha information in the image will be ignored. Animate Using Animation Tools: By default, a drawing layer can be animated using the same parameters as a peg, but you can disable this feature. Being able to switch your drawing layers so they can no longer be animated without a peg has certain advantages. In cut-out animation, it is easier to separate your drawing exposure and keyframes to change timing easier and rearrange keyframe position in the Timeline view. This feature is also available for backward compatibility when bringing in templates created in older versions of the software, so as not to lose their offset keyframes or drawing substitution keyframes. In the X, Y and Z axis fields, type the coordinates of where you want to offset the visual trajectory. By default, the trajectory is displayed at the centre drawing, using the layer's pivot position. If you want to move it so it corresponds better with your drawing, either type new coordinates or use the Spline Offset tool available in the Advanced Animation toolbar. To display the trajectory in the Camera view, select your drawing and select View > Show > Control. You can also press Shift + F11 (Windows/Linux) or ⌘ + F11 (Mac OS X). • Left: The default alignment for drawings; aligns the drawings to the left side of the scene’s alignment rectangle. Harmony scales the drawings to match their height to the alignment rectangle of the scene. 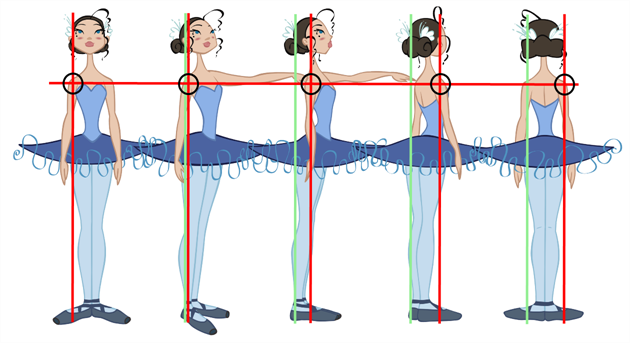 • Right: Aligns the drawings to the right side of the alignment rectangle. Harmony scales the drawings to match their height to the height of the alignment rectangle of the scene. • Top: Aligns the drawings to the top of the alignment rectangle. Harmony scales the drawings to match their widths to the width of the alignment rectangle of the scene. • Bottom: Aligns the drawings to the bottom of the alignment rectangle. Harmony scales the drawings to match their widths to the width of the alignment rectangle of the scene. • Centre Fit: Centers the drawings. • Centre Fill: Centers the drawings and then scales them so the width or height fills the available space. • Centre LR: Aligns the drawings in the left-right centre of the alignment rectangle. Harmony scales the drawings to match their height to the height of the alignment rectangle of the scene. • Centre TB: Aligns the drawings in the top-bottom centre of the alignment rectangle. Harmony scales the drawings to match their widths to the width of the alignment rectangle of the scene. • Stretch: Scales the drawings so they fit within the alignment rectangle of the scene. This is particularly useful for images that you will manipulate with a Quadmap node. If the drawings in the Quadmap node do not have the same aspect ratio as the alignment rectangle of the scene (from the Scene Settings dialog box), the handles on the quadmap will not appear on the corners of the image, making it difficult to manipulate the quadmap. In this case, you would set the drawing layer of the quadmap images to Stretch to make the handles appear on the corner of the image. This can have the effect of distorting the images, but it is not an issue with images that will be distorted through the Quadmap node anyways. Flip Horizontal: Flips the drawing on the X-axis. Flip Vertical: Flips the drawing on the Y-axis. As you move the camera in your scene along the Z-axis, notice that, logically, the lines of the elements become thicker the closer the camera gets to the drawing. If you prefer the lines to remain the same size or become thicker at a different speed, you can use the thickness feature to adjust your brush stroke and pencil line thickness. You can modify the size of the lines even if the camera is not animated. To learn how to use this feature, see Camera Truck-ins and Line Thickness. Adjust Pencil Lines Thickness: Lets you work with pencil lines and adjust their thickness. You will not see any changes to lines in the Camera view OpenGL mode. You must switch to the Render mode. Normal Thickness: Disables all overrides on the brush stroke line thickness. This option must be enabled in order for the pencil line thickness parameter and pencil lines to appear. 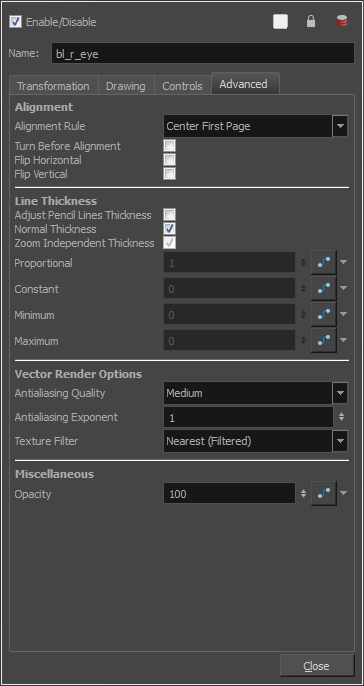 If you want to modify the brush stroke thickness, deselect this option. To enable brush strokes to work with the line thickness feature, you must first create central strokes in the Colour Art layer. The central strokes control the line variation of your brush strokes in the Line Art layer. Select Drawing > Create Colour Art from Line Art. Zoom Independent Thickness: Select this if you want your line thickness to remain constant independently from the camera move. Everything else will increase in size, but the line thickness will stay the same. Proportional: Enter a multiple by which you want to increase the line thickness base on its original thickness. A value of 1 will result in no change; a value of 0 (zero) will hide the lines. Constant:Enter a value in pixels (based on a 720x540 screen resolution) to indicate the amount of pixels you want to add around the existing line. Minimum: Enter a value in pixels (based on a 720x540 screen resolution) for the minimum line thickness allowed. Maximum: Enter a value in pixels (based on a 720x540 screen resolution) for the maximum line thickness allowed. • Antialiasing Quality: A smoothness (antialiasing) setting applied to the final rendered image. • Antialiasing Exponent: Controls the size of the area around the final image edges used in the antialiasing process. A higher value uses less area, resulting in sharper edges, while a lower value uses more area, resulting in softer edges. If the Antialiasing Quality value is set to Low (no antialiasing) or Medium Low, this value is ignored. Values: Between 0 and 1. • Opacity: Lets you quickly change the transparency of the selected element. Opacity settings here will be reflected in both OpenGL preview, and full render.